Huskie Family Connections (HFC) invites all parents, students and additional family members to join in the variety of Spring Family Weekend activities and events taking place during the weekend Friday, April 27, through Sunday, April 29. Spring Family Weekend is not only an excellent way for NIU families to get acquainted with the campus and surrounding community, but it also provides the opportunity to spend quality time with their Huskie students. In addition to several on-campus activities, this year’s HFC-sponsored events include a “Family Fiesta” with dinner and dance show as well as a special breakfast buffet with VIPs from various departments on campus. 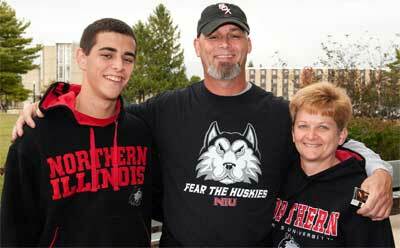 Registration for NIU Spring Family Weekend is available through Friday, April 20. Early registration is strongly encouraged. This event is sponsored by NIU Huskie Family Connections and Student Involvement & Leadership Development. For more information, call (815) 752-2222 or email parents@niu.